I’m seriously hoping not to get sued for this recipe. This is just a demonstration Kellogg’s! Honestly, they should just be happy I used the name brand cereal today. 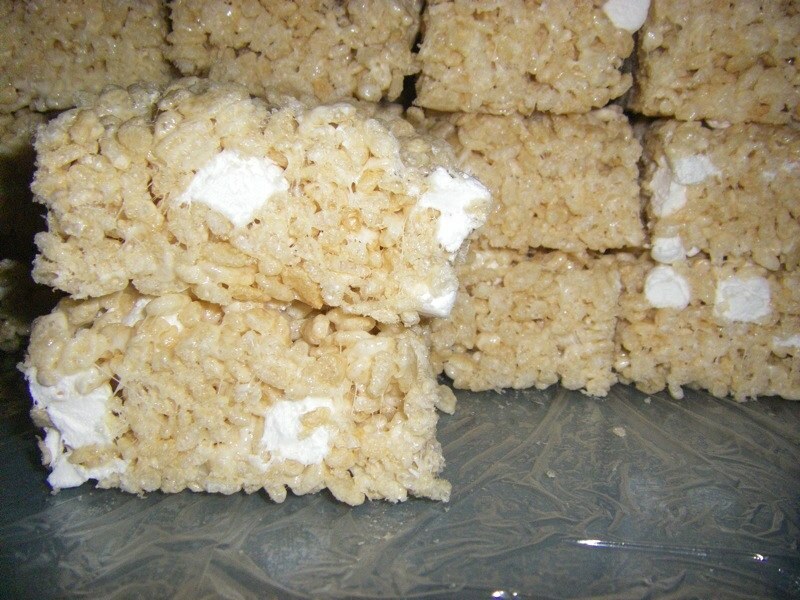 Surprisingly, one of the most frequently asked questions from my friends is how do I make Rice Krispie Squares that stay soft and gooey instead of turning into bricks the next day. The answer is simple: it’s the marshmallows that go hard, so decrease the marshmallows and/or increase the butter and Rice Krispies and your squares will stay softer longer, up to a week if covered with plastic wrap. 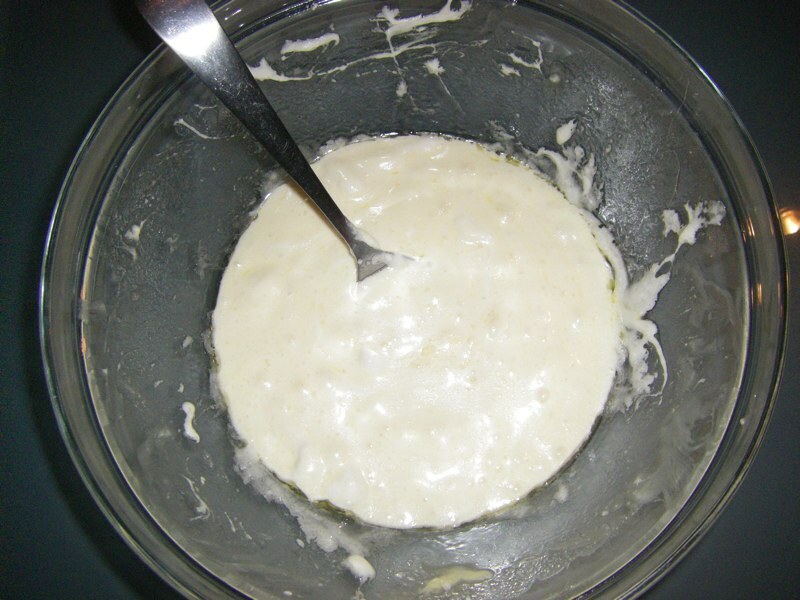 Another good tip is to make the squares in a large glass bowl using the microwave. The glass bowl is easy to clean with just hot water and the entire recipe only takes about 3 minutes to make using the microwave (not including optional setting time). 1/3 cup of butter (original recipe calls for 1/4 cup). 5 cups of small marshmallows, broken down into 4 cups for melting and 1 cup for adding later. 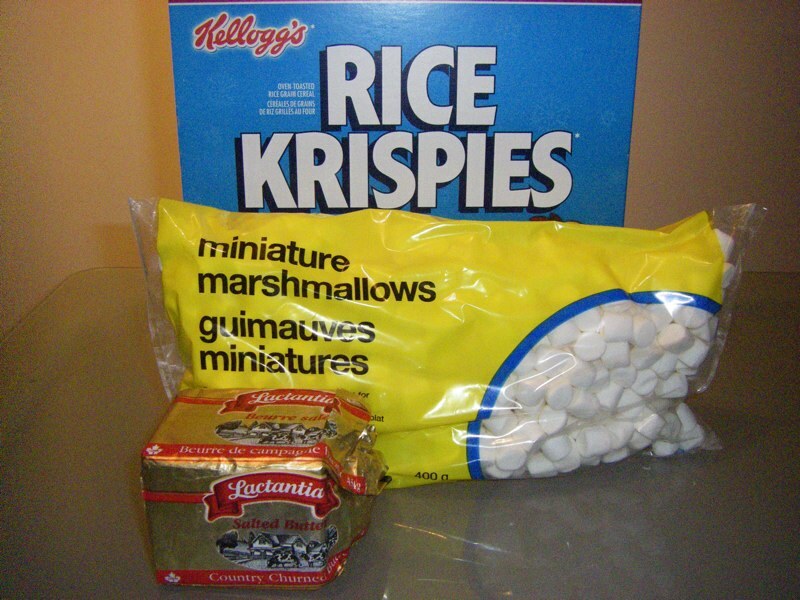 8 cups Rice Krispies cereal (original recipe calls for 6 cups). 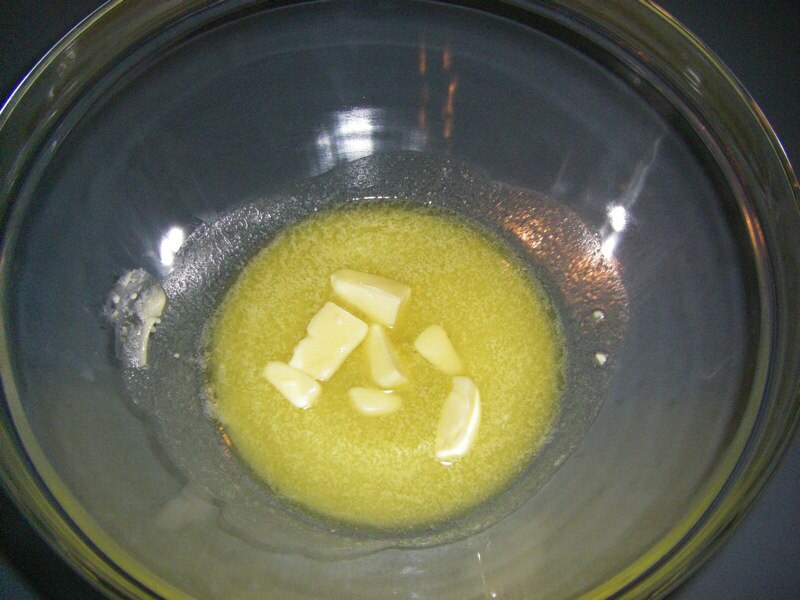 Melt 1/3 cup of butter in a large glass bowl in the microwave for 30 seconds. The butter does not have to be entirely melted, it’s going back in! Stir four cups of marshmallows into the butter and microwave for 1 to 2 minutes. The marshmallows will puff up in the microwave. Stir them and watch them deflate into a smooth creamy consistency. If you are including vanilla extract, stir it in at this point. 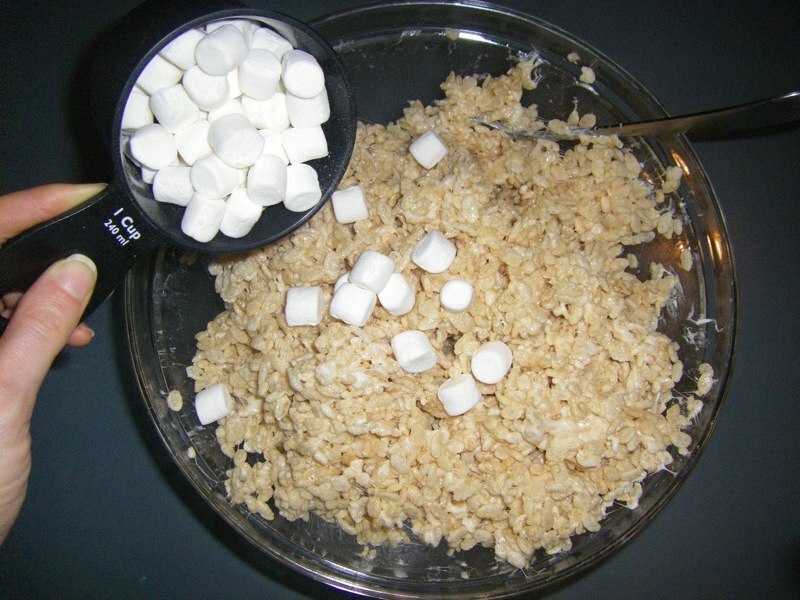 Stir in all 8 cups of Rice Krispies. Then stir in the last 1 cup of small marshmallows. This gives you fun pockets of marshmallowy goodness throughout the squares and looks pleasing too! Line a 9 x 13 baking dish with plastic wrap. You will thank yourself for this step later! 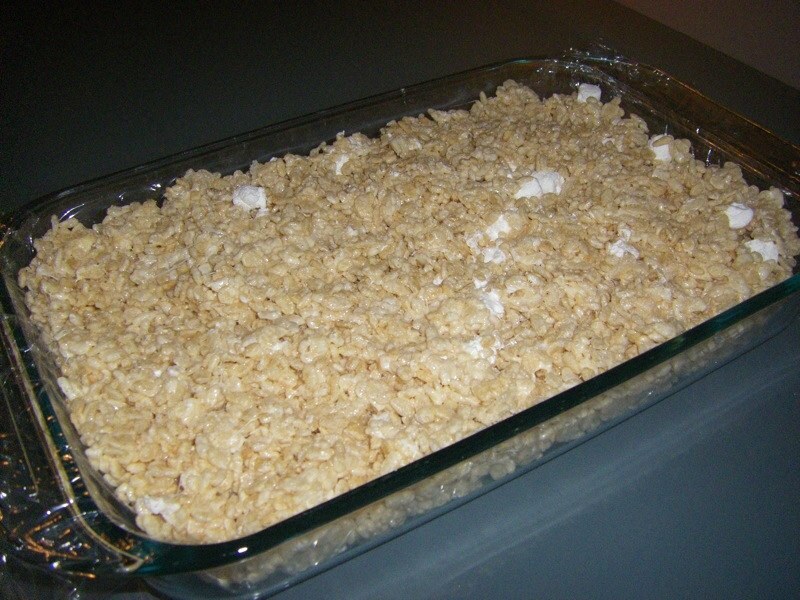 Press the Rice Krispie mixture into the pan. I do this by scooping the mixture into the pan, placing a piece of plastic wrap over the entire dish and pressing everything down with my hands. All done! Nothing is better than creating a sweet snack in 3 minutes flat! 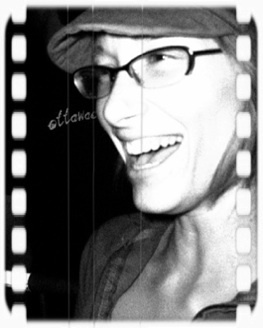 Of course, you should allow a little bit of time for everything to set. An hour is ideal, but honestly I always sneak one out of the pan right away. That first square kind of falls apart, but it reaches the tummy anyway! Now for the softness test: did your squares stick around for a whole week? Jump up.